You are viewing the Dan Savage tag archive. Bullying. It’s my belief that no one hears this word without a pang; all of us have stories of being bullied at some point in our lives, and never is it more damaging and hidden than when we are young. 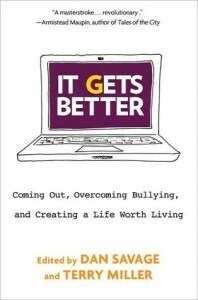 Thankfully, positive response to bullying is on the rise, from the It Gets Better Project (an online video project and book reaching out to LGBT youth since 2010), to the documentary Bully (a 2011 film about bullying in U.S. schools), to Everyone’s Beautiful (a teen-run Facebook group that provides a forum for teens to share their stories and find support).